Borghi & Teager on this week’s ‘Hearts of Space’! 2. We’re the only artists with multiple tracks on “SAXOPHONIC.” That was definitely unexpected. For full station listings, go here. The program is syndicated to over 200 NPR stations throughout the US. Posted on February 9, 2014 Categories NewsTags ambient music, ecm, hearts of space, jan garbarek, john surman, matt borghi, michael teagerLeave a comment on Borghi & Teager on this week’s ‘Hearts of Space’! As a follow-up to our previous appearance on Echoes, Matt Borghi and myself will be featured on today’s episode. Our previous episode featured our Living Room Concert, whereas today’s episode will feature the longform interview conducted by host John Diliberto. Both episodes are in support of Convocation, and they were taped just a day after we recorded Awaken the Electric Air. Check your local listings (here and here) and tune in! 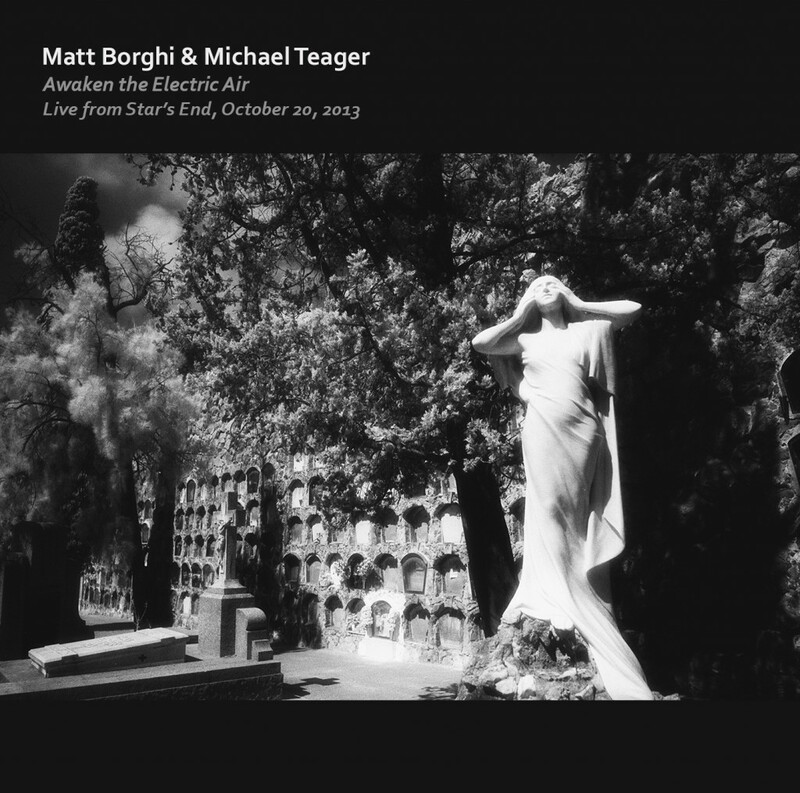 I’m happy to announce that Matt Borghi & Michael Teager‘s new live album Awaken the Electric Air: Live from Star’s End, October 20, 2013 is now available. As the title indicates, this is a recording of our full live set on WXPN’s Star’s End, a pillar of ambient music hosted by Chuck van Zyl. This performance was part of Matt’s and my exhilarating promotional tour of Philadelphia. Our set included renditions of two selections from Convocation as well as a number of new pieces. Aside from being broadcast live over the airwaves, our performance was for an intimate in-studio audience during the 4:00 AM hour following our 10.19.13 performance at The Gathering. We’re proud of this performance and happy to make this available to the public. To keep from stealing Convocation‘s thunder, this is somewhat of a “soft launch” for now. The album is currently only available for hard copy purchase – a digital release is months away. Until then, hard copies may be purchased via Kunaki or at live performances.